Box Text: You're a ragin' Cajun on the tail of a swamp rat. For the first time ever, three of the most awesome action video experiences explode into one mean swamp stompin' adventure. From zappin' mobsters and wrestlin' gators in muddy marshes, to chasin' through the streets of New Orleans, drivin' and shootin' in your road huggin' four wheel drive doom machine, you're up against it all! 'Cause dat Gangster king of Bourbon Street has snatched your best girl - pretty little Annabelle, the sweetest honey around - and run her off to his heavily armed estate, a plantation filled with perils and pitfalls. So muster up your courage and sharpen your foot long blade. It's time to go huntin'. But if you ain't careful, the prey will eat you alive - I Gar-Ron-Tee! 07-31-2015 brodus Box Text You're a ragin' Cajun on the tail of a swamp rat. For the first time ever, three of the most awesome action video experiences explode into one mean swamp stompin' adventure. From zappin' mobsters and wrestlin' gators in muddy marshes, to chasin' through the streets of New Orleans, drivin' and shootin' in your road huggin' four wheel drive doom machine, you're up against it all! 'Cause dat Gangster king of Bourbon Street has snatched your best girl - pretty little Annabelle, the sweetest honey around - and run her off to his heavily armed estate, a plantation filled with perils and pitfalls. So muster up your courage and sharpen your foot long blade. It's time to go huntin'. But if you ain't careful, the prey will eat you alive - I Gar-Ron-Tee! 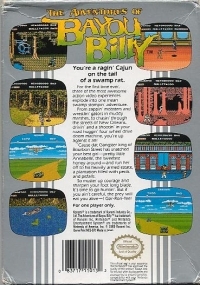 This is a list of VGCollect users who have Adventures of Bayou Billy, The in their Collection. 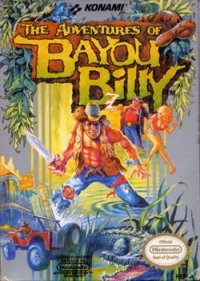 This is a list of VGCollect users who have Adventures of Bayou Billy, The in their Sell List. 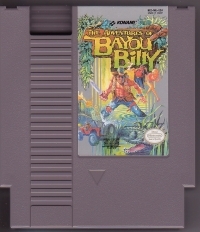 This is a list of VGCollect users who have Adventures of Bayou Billy, The in their Wish List.